To make this side dish feel extra special, cut and clean the tips of pine branches (which are edible by the way!) and line your serving platter with them. Put your deviled eggs on top, and they wont slip around ... which means you can eat even more of them. Happy Easter folks! 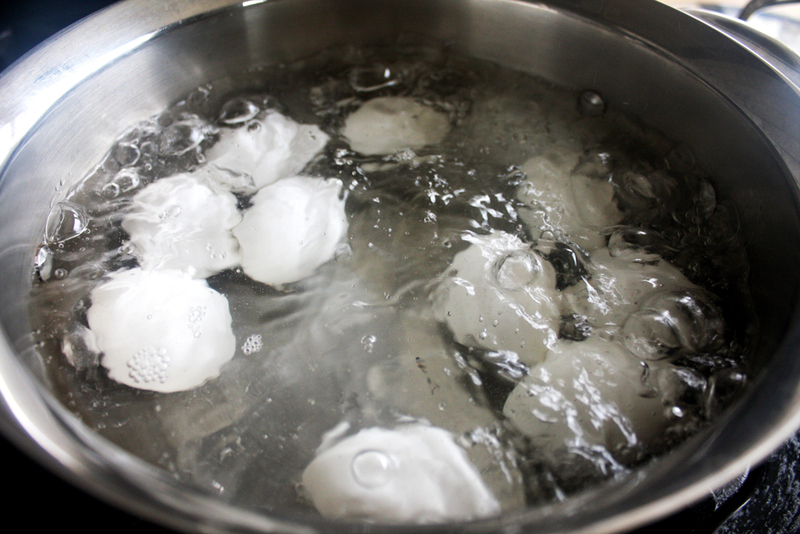 Put all the eggs in a pot, and fill with water, covering about 1 inch over the eggs. Bring to a boil, then turn off heat and set aside for 15 minutes.Drain, then refill the pot with cold water. After the eggs are cooled, gently peel the shell off of the eggs. Remove salmon skin and bones from the filet. Flake about a quarter of the filet into larger pieces to top off the eggs, and finely chop the rest of the smoked salmon. Cut the cooled and shelled eggs in half, lengthwise, cleaning your knife with a paper towel after each cut. Gently pop out the yolks and put into a mixing bowl. Add the mayo (or mayo substitute), sour cream and mustard to the yolks and mix until the texture is smooth. 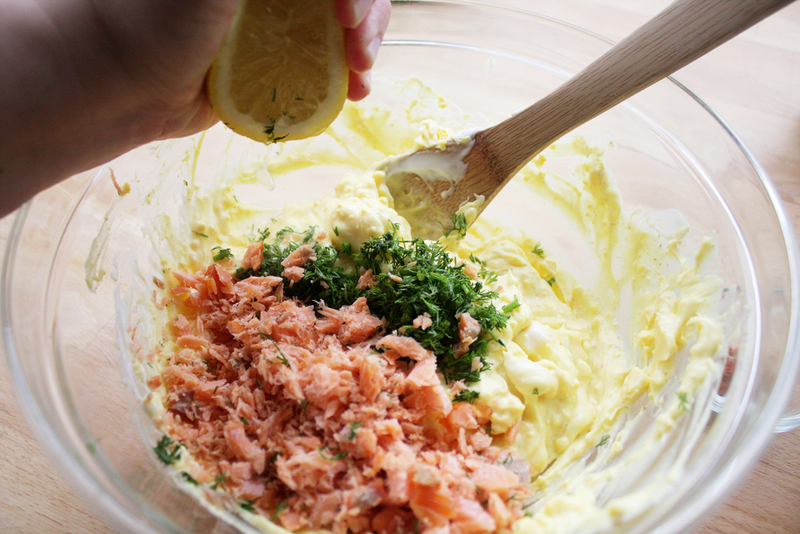 Stir in the smoked salmon, chopped dill and the juice of half a lemon. Add salt and pepper to taste. Take a plastic storage bag and fill about halfway with the yolk mixture. Twist to one corner, then cut a little tip off. Pipe the mixture into egg whites to the desired amount. 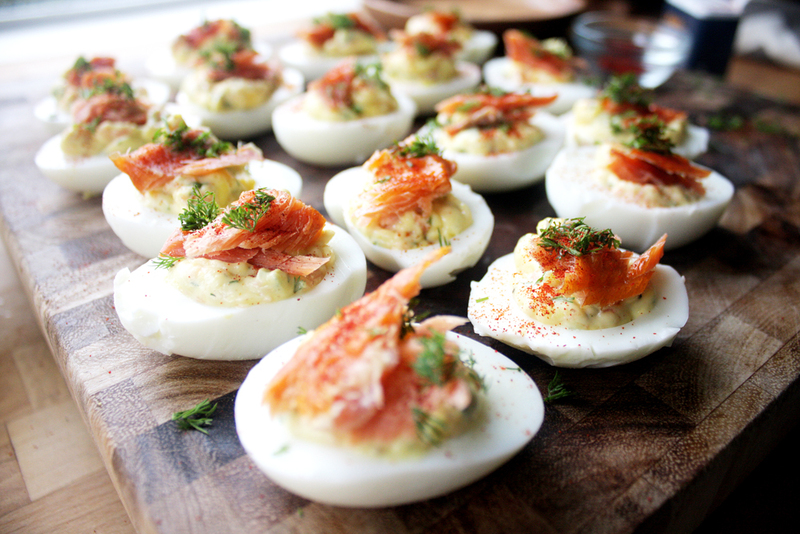 Garnish the eggs with smoked salmon, dill and a dash of paprika. Serve immediately, or store in the refrigerator up to 24 hours. Mayo and I have no hard feelings towards each other, but sometimes it's annoying to look over at the side dish you made, and wonder how it became unappetizing 5 minutes under the sun. Switching out a few things makes this potato salad perfect for your next bbq, creaminess included.